I was raised in the Maryland suburbs right outside Washington DC and was privy to see some of the world’s greatest works of art exhibited in galleries at the Corcoran, Hirshhorn, National Gallery, and Phillips Collection (my favorite). The fact that all these galleries had their own Picassos didn’t necessarily impress me. I wasn’t that fond of Picasso, especially his Cubist works that looked like someone slashed the canvas a couple hundred times over. In fact, it not only took me forty years to appreciate art in general, but one of Picasso’s own piers, Georges Braque, to help me understand Picasso. Braque would do little collages of still life set ups, but split the wine bottles and bowls and apples into sections, then distribute them around the canvas, freeing himself – and the viewer – from experiencing art in the usual way. Although Braque and Picasso are synonymous with the invention of Cubism, I’ve been less partial, or perhaps comfortable, with Picasso, who often split women’s faces and breasts up and placed them in the darndest places by the time the painting was finished. But I credit both artists for inspiring me to look deeper at the possibilities for art, including my own. 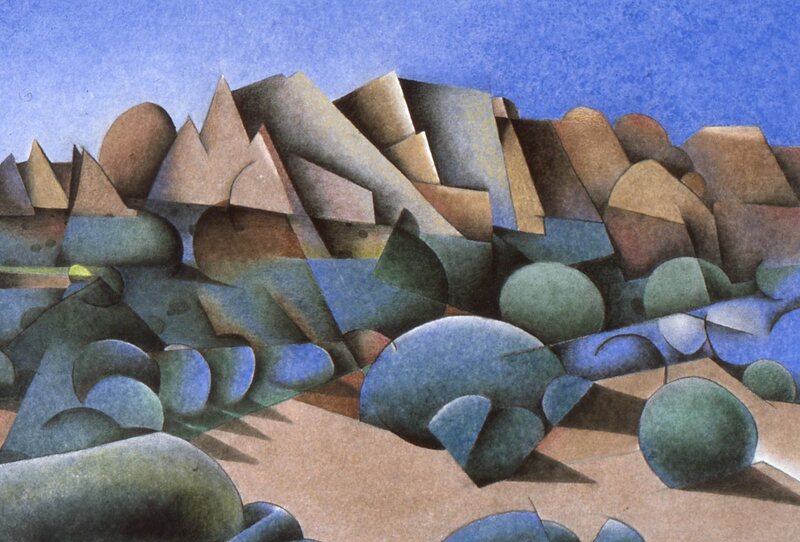 The image above, “Fins,” is my pastel drawing of the strange and angular rock formations I saw traveling in Utah’s Arches National Park. This range of rocks not only roused my interest, but lent itself well to a Cubist-style breakdown. The completed composition reveals the way I wanted to see the rocks, ones that resembled fish fins in my mind, or so I thought. I worked in this style for a number of years but stopped when I felt I was relying too much on a kind of visual formula. I’d seen many Cubist paintings, especially after teaching about the Cubism movement as a high school art teacher, and questioned if my art pieces weren’t becoming patterned around Cubism so much I was losing my own statement in the process. A few years later when I lectured on the Surrealists’ method of staying up many nights in a row without sleep to get altered views of subject matter for their paintings, one of my students tried it at home. After just one night, and looking like hell come morning, his parents called me to complain how I’d put bad ideas into their son’s head. Teaching art is hard. H-a-r-d. There are so many fine lines. Those lines are easy to cross over, for working artists as well as students. But a student being over-educated about art? Is such a thing possible?